The weekend was really busy again, so there are no Farmers' Market pictures this week... :( We had the chance to pick up some great veggies (as well as some toffee....) but there was no time to document anything... I made my Summer Salad this weekend, and we enjoyed the fresh tomatoes, cucumbers & red onions that we picked up at the Farmers' Market. Tuesday: Pasta in Creamy Sun-Dried Tomato Sauce with Red Peppers and Artichokes - Sophia at Burp and Slurp posted this recipe a while ago, and I have wanted to try it ever since. The dish has sun dried tomatoes, Trader Joe's red pepper-artichoke tapenade as well as Greek yogurt. Sounds delicious, and I can't wait to try it. Wednesday: Grilled Italian Sausages on multi-grain rolls. We'll have a salad on the side. Thursday: Shrimp fried rice. I'll use brown rice and will add lots of veggies. Friday: It's "Salad Friday." I'll make my own, healthy version of a Cobb salad with spinach, herb salad mix, tomatoes, avocados, hard-boiled eggs, cheese, grilled chicken breast and whatever else I can think of. I'll make a vinaigrette with olive oil, balsamic vinegar, salt, pepper, lemon juice and Dijon mustard to go on the side. I'm even more excited than you that you are trying that pasta recipe! yay! I hope you like it...but please don't send me hate mail if you don't...lol! My favorite salad is your Summer Salad. It was loved by all! Any and all veggies, and a lot of grilled salmon. Lately my favorite salad that I've had almost every day for lunch is spinach, craisins and feta with some balsamic vinaigrette. I make my own dressing for a few days out of 2 T. balsamic, 1 T. olive oil, 1 T. lemon juice, a few shakes of dried oregano and a dash of fresh ground pepper. Your summer salad looks delish! 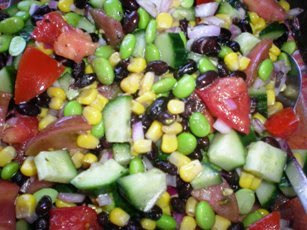 My favorite salad is a southwest style... black beans, chicken, corn, spiciness...ah I love any variation of it! Your meal plan looks great..can I come over for dinner?! Hehe. Ever week I say I am going to do a meal plan and somehow it never gets done. I just need to sit down and do it! Looks like your planning some yummy meals!